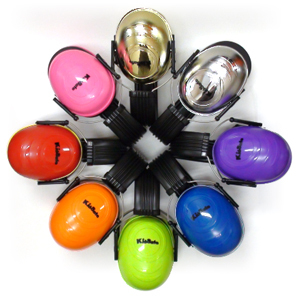 Tasco Kidsafe Hearing Protection Ear Muffs for Kids are sized and designed especially for children. Kidsafe Ear Muffs feature heavily padded headbands and ear pads for all-day comfort. With this heavy padding and a low headband clamping force, Kidsafe is ideal for babies and children alike: these ear muffs will comfortably and safely fit infants 3 months old, all the way up to small adults. With an NRR of 25, Kidsafe Ear Muffs offer very good protection from noise. With a few exceptions, most other ear muffs for babies and children have much lower noise reduction ratings of 19 to 21. For very loud events such as live music and motor races, we recommend choosing a higher NRR ear muff, such as the Kidsafe. With great noise protection and an economical price, the Tasco Kidsafe is an excellent choice for protecting your child's tender ears in a wide variety of noisy situations! Now available in 8 colors, including silver & gold! Tasco Kidsafe Headband Style Ear Muffs (NRR 25)5Sarah WJune 28, 2016I LOVE these - very versatile and grow with my children. I bought some for my daughter when she was 6 months old, now she's 2, and she will be able to use them for years to come! More than that, I LOVE this company, and it was very helpful to look at their comparison chart, etc when making the decision to purchase these. Tasco Kidsafe Headband Style Ear Muffs (NRR 25)4JoelMay 24, 2016Great product at blocking out the very loud noise, but you can still hear people talking close by. My daughter wears these whenever there is a noisy situation: vacuuming, auto racing, fire alarm testing, etc. I was very surprised that they fit on her head and even fit on my head, as I am not a small person. Tasco Kidsafe Headband Style Ear Muffs (NRR 25)5CourtneyOctober 27, 2015Our 7 year old wore these the entire time of the Blue Angels air show! They were comfortable, blocked the noise, but you can still hear people talking to you! Much more comfortable and better noise block then the yellow ear plugs that get inserted into the ear (especially for children). Tasco Kidsafe Headband Style Ear Muffs (NRR 25)5P. CosteaOctober 6, 2015Don't know how they do it, but they block out all the background noise but you can still hear people talking to you. I'm truly amazed! I bought them for my daughter whose 15 now, and can't stand alot of noise and commotion. They fit her and also fit me well. Thanks. Highly recommended. Tasco Kidsafe Headband Style Ear Muffs (NRR 25)5KristinSeptember 11, 2015I tried these on my 5 month old a couple times for just a couple minutes prior to the event to get him used to them. He did great - didn't seem to mind them at all. Tasco Kidsafe Headband Style Ear Muffs (NRR 25)5JamieAugust 24, 2015These came fast! Store was great with answering questions, and giving me alot of help. I bought these for my 7 year old to use at loud events, like concerts, fireworks, etc. and bringing them to Disney in case Fantasmic is too loud. I am glad I bought these with the Nrr 25. I was afraid they would block out too much, but they don't. Everything is taken down to a lower level. I can't say how great they will be at an extremely loud event, but the higher the Nrr the better anyway. They are extremely lightweight, and even though they don't fold, they are quite compact. I will say they do fit my head too!!! I am a petite woman, and they are very comfortable. We bought the gold, and the muffs are really pretty!!! My daughter loves them!!!! I think the gold and silver color is also perfect for a 10-14 year old who would want a trendier look. Tasco Kidsafe Headband Style Ear Muffs (NRR 25)5EricaJuly 23, 2015I purchased these ear muffs prior to taking my boys (7 m and 2 yr) to a 4 wheel jamboree. My 7 m old didn't mind them a bit and when it was time for a nap he slept soundly with the ear muffs on even when loud trucks were nearby. Very happy with my purchase. Tasco Kidsafe Headband Style Ear Muffs (NRR 25)5Monica HermanJuly 14, 2015These were for my 2 year old who loves to ride along on the mower. He will keep them on for hours and loves wearing them around the house. His "hones" are with him often. Worked great for the 4th of July too. Highly recommend this item. We will be ordering more 4 more sets of these! Tasco Kidsafe Headband Style Ear Muffs (NRR 25)5GrandmaJune 14, 2015We took our grandson to Monster Truck Jam. Saved the day! He had a wonderful time! Thank you! Tasco Kidsafe Headband Style Ear Muffs (NRR 25)5Father of Asbarger SonFebruary 22, 2015I have a pair of Tasco Golden Eagle earmuffs and love them - when my son's school asked about my hearing protectors which my son uses occasionally, I looked for something that was less easily converted into a weapon and ordered the Kidsafe muffs in his favorite color (Blue). I thought they looked small on arrival but they fit his big 11-year-old head comfortably. He now uses them in class to minimize distraction when he is doing work - and pops an ear out to hear instruction. My son reports that they are working well and he loves the color. Ear Plug Store fulfilled the order quickly and sells the item at a fair price. Thanks!!! Tasco Kidsafe Headband Style Ear Muffs (NRR 25)5katie DFebruary 18, 2015So far this has been a great product. We have tried it a few times on our 1 yr old, and so far it has worked well. He typically will take off hats but he has left these on so they must be comfortable. Shipping was super fast, and the product was exactly as described.We live on a ranch and the tractors are very loud, so this was a great solution. We are looking forward to many other applications for using these. Tasco Kidsafe Headband Style Ear Muffs (NRR 25)5Autism MomJanuary 16, 2015These Ear Muffs were great! My husband and I have been wanting to take our boys to a hockey game but they complain about the noise. I've been researching ear muffs for a while and decided to go with the Tasco Kidsafe because it has the highest NRR that we could find with a low enough price since I needed 3. My oldest has autism and is very sensitive to loud noises, so the ear muffs along with earplugs kept him happy! Everybody loved the game and we're excited to go see another! Tasco Kidsafe Headband Style Ear Muffs (NRR 25)5Rich MJanuary 9, 2015These are great ! They come in all colors, my 2 girls wanted pink and purple - to wear to the Monster truck racing ! LOL. They fit great, are comfy, come in a carry/storage bag. Noise protection level is excellent and the price is affordable. Tasco Kidsafe Headband Style Ear Muffs (NRR 25)5Mickael PDecember 10, 2014We bought 2 for our kids for when we go see movies and they just love them. Even at home they wanted to wear because they are so comfy. Really a great product. Tasco Kidsafe Headband Style Ear Muffs (NRR 25)5Breah MNovember 13, 2014Got the lime green Tasco Kidsafe Headband Style Ear Muffs for my 18 month old and they fit perfectly and will have enough room to grow with her. She loves to do whatever her daddy is doing (aka: leaf blowing, snow blowing, being in the garage while he is using an electric saw), but she is VERY sensitive to noise and gets nervous. Not anymore! She loves that she and Daddy have matching earmuffs and she rides along in a baby backpack while he does loud yardwork and she couldn't be happier! Tasco Kidsafe Headband Style Ear Muffs (NRR 25)5Jeremy MOctober 30, 2014I bought these for my older son when we were going to another Nascar weekend. I already have a set for my younger son and they are great for concerts as well. Tasco Kidsafe Headband Style Ear Muffs (NRR 25)5Troy SOctober 1, 2014My 7 month old wore them at an electronic music festival we attended recently. He was great. He even fell asleep during the concert. I would highly recommend. Tasco Kidsafe Headband Style Ear Muffs (NRR 25)5SandiSeptember 18, 2014The product is great. Fits my 20 month old and 3 yr old grandchildren great. Lightweight and great when we go to the races every weekend. Tasco Kidsafe Headband Style Ear Muffs (NRR 25)5MargaretAugust 11, 2014Bought these for my 3 1/2 yr old grandson to go to a monster truck show. He loved them and wore them for the show. He doesn't usually like loud sounds, not a firework fan, so these were perfect for him to enjoy the show! Tasco Kidsafe Headband Style Ear Muffs (NRR 25)5CarlaJune 22, 2014Bought these for my 5 month old grand daughter! She was out with us for trap shooting and fell asleep! Great way to protect her hearing and enjoy family fun together! Preparation for our next shooter! Tasco Kidsafe Headband Style Ear Muffs (NRR 25)5DanMay 27, 2014Ordered for our 3 year old. He will wear them and they fit well and he's a little guy. Tasco Kidsafe Headband Style Ear Muffs (NRR 25)5AndreaMay 26, 2014Super comfy and effective for my 2 1/2 year old son. He wears them when he's around the lawn mower. Tasco Kidsafe Headband Style Ear Muffs (NRR 25)5KATHERINE-ELIZABETHMay 14, 2014GREAT I LOVE THEM. SEEMS TO BE GOOD QUALITY. WILL USE THEM WHEN MY HUSBAND DOES RENOVATIONS AROUND THE HOUSE AND IT SCARES THE LITTLE ONE! Tasco Kidsafe Headband Style Ear Muffs (NRR 25)5CodyyMarch 9, 2014Just got a second pair for my next son. My oldest loves his. They are comfy for him and they work great. Great product. Great company. Will buy for any other kids I have as long as they are still around! Tasco Kidsafe Headband Style Ear Muffs (NRR 25)5AmyFebruary 9, 2014We got these to use this summer. Have used them once so far and they worked great. My son slept through kids playing around him at Great Wolf Lodge. Tasco Kidsafe Headband Style Ear Muffs (NRR 25)5Deb T.February 5, 2014Great Product. They really mute the sound for the kids. They're very good quality, fit nice, and come in bright colors that the kids love! I would recommend this product! Tasco Kidsafe Headband Style Ear Muffs (NRR 25)5BFebruary 5, 2014Got these for my son for Monster Jam. He doesn't like loud noises but loves wearing them. Tasco Kidsafe Headband Style Ear Muffs (NRR 25)5JimFebruary 2, 2014Great product..my 3yr old Grandson loves them! Tasco Kidsafe Headband Style Ear Muffs (NRR 25)5Cathy KellyNovember 28, 2013Bought these ear muffs for my 6 year old grandson and he loves them so much he wouldn't take them off at the boat races! Tasco Kidsafe Headband Style Ear Muffs (NRR 25)5MomOctober 12, 2013These are great. My son is 5, & he's an amazing Aspy, but he sometimes gets overwhelmed when it's loud. He would not wear the black pair I got for him on Amazon, by P****r b/c they were not his color. Sometimes he'll only wear red. I bought 2 pair, 1 for home, & 1 for school. He says they are comfy, & they adjust easily so they'll fit for a while. Thanks for making a comfy red pair. Tasco Kidsafe Headband Style Ear Muffs (NRR 25)5MariaSeptember 8, 2013This was an amazing purchase. Thanks to the muffs my son stayed on his regular routine and was able to sleep through the wedding without hearing a peep. We were anxious about the wedding and this sloved the problem so we could enjoy ourselves. Thank you. Highly recommend. Also it was a hit- everyone thought he looked very cute in his muffs! Tasco Kidsafe Headband Style Ear Muffs (NRR 25)5JoshSeptember 4, 2013My son has really sensitive hearing for certain noises. These earmuffs work great I tried them on myself. He loves them they are comfortable and work amazing. Only took 6 days for Canadian shipping. Better quality then anything on the market at the kids stores here. They don't have NRR rating and being in industry I'm big on proper protection. Will definately be getting my daughter a set as well!! No more running inside when someone mows their lawn! Tasco Kidsafe Headband Style Ear Muffs (NRR 25)4MindyAugust 22, 2013These worked out great for the music concert we went to. Going to try them at the car races this weekend. Great item at a GREAT price. Tasco Kidsafe Headband Style Ear Muffs (NRR 25)5WillAugust 18, 2013Bought two for my two grandsons, 4 and 2-1/2. It was the older's birthday, but thought that the little one would feel left out. Got blue and orange, giving the birthday boy his choice, he went for the blue and won't take them off. At dinner, they both wore their head sets, and were shouting back and forth, "What, I can't hear you!" It was hilarious. I think these work very well to dampen noise. Thanks. Tasco Kidsafe Headband Style Ear Muffs (NRR 25)5ErinAugust 17, 2013Bought for 7month old, 2 year old, and 6 year old. All fit great and they love the colors! We use them at the race track and for fireworks. Tasco Kidsafe Headband Style Ear Muffs (NRR 25)5SECAugust 13, 2013I bought these to take my daughter to sprint car races. She left them on throughout the night and they were very adjustable. I think that I could wear them comfortably (I have a small adult head). I am very, very happy with the purchase. We got them in orange to match her dad's car. :) I'd be comfortable putting them on a smaller baby too and they will definitely last many, many years of growing. Tasco Kidsafe Headband Style Ear Muffs (NRR 25)4DCAugust 13, 2013Good earmuffs, fit our 6 mo old daughter which was questionable when ordering. The fit will definently get better, but the db protection is better than a lot others out there! Tasco Kidsafe Headband Style Ear Muffs (NRR 25)5ARAugust 11, 2013Bought some these for my sister's grand kids and they like them. Been receiving pictures of them wearing their earmuffs! Nice choice of bright colors and good noise reduction rating. Tasco Kidsafe Headband Style Ear Muffs (NRR 25)5NhJuly 24, 2013My kids loved their first broadway show using these earphones when seated in the fourth row. They don't like loud noises and with these earphones they enjoyed every. Minute. Tasco Kidsafe Headband Style Ear Muffs (NRR 25)5NoraJuly 1, 2013These work great! The baby (8 1/2 mos) slept through two Sprint Cup race cars firing up not 50 feet away! Tasco Kidsafe Headband Style Ear Muffs (NRR 25)5Lori SouliereJune 24, 2013We go to the truck and tractor pulls and the Monster Trucks so these come in very handy. It fit my 2 year old son perfectly. Tasco Kidsafe Headband Style Ear Muffs (NRR 25)5LisaJune 16, 2013I bought these headphones for my grandson. We used them at the demolition derby. And they worked great. He has some sensory issues. And does not like loud noise at all. And he was able to be at the demolition derby without any problems at all. They work great. They fit great. I would recommend them to anybody. Tasco Kidsafe Headband Style Ear Muffs (NRR 25)5Preemie MomJune 9, 2013My daughter was born a 26-week preemie and still, at age 3, struggles with sensory issues. We were faced with paying out-of-pocket huge expenses for auditory therapy, or trying these ear muffs. $20 later, we are as happy as can be! My daughter has worn them to loud kids events (honking horns, large crowds), loud church services (which she used to freak out at) and concerts. Basically, we pack them in the bag anywhere we go. Then, if we are caught off guard with something loud that frightens her, she asks for her purple ear muffs, and everything is o.k! I am SOOO glad we tried these! Back to normal life without freaking-out episodes! She loves them too. They make her feel safe when the scene is chaotic. I'm so glad to see her enjoying life again! Tasco Kidsafe Headband Style Ear Muffs (NRR 25)5JenJune 7, 2013My daughter was 8 weeks old, and I was worried about the dirt bikes. She slept through the races. Great product !! Tasco Kidsafe Headband Style Ear Muffs (NRR 25)5annJune 3, 2013My 2 1/2 year old daughter just loves them. They fit great and she even walks around with them on!!! Tasco Kidsafe Headband Style Ear Muffs (NRR 25)5Elizabeth PiperMay 31, 2013works great very confertable my grandson does not mind them on at all. Tasco Kidsafe Headband Style Ear Muffs (NRR 25)4amyMay 13, 2013These were great for the dirt track we went to, but they are a little big for my 3 mo old daughter they did slide off some but they did the job. SHe didn't hear a thing i don't think she ended up falling asleep. Tasco Kidsafe Headband Style Ear Muffs (NRR 25)4Patricia EdwardsMay 11, 2013I bought these for my 4 year old son and he loves them. They were delivered extremely quickly. My son tried them on and wore them around the house. He wore them at the Monster Truck Rally and didn't complain about how loud it was (he is very sensitive to loud noises. Tasco Kidsafe Headband Style Ear Muffs (NRR 25)4MgnliaMay 7, 2013My 5 month old tolerates wearing these most of the time, she is very sensitive to sounds and im glad i got them! The only thing i wish were different is they clamp on pretty tightly, she gets sweaty, divited rings aroung her ears after wearing them for a bit. I still recommend them... Great price too! Fast shipping! Tasco Kidsafe Headband Style Ear Muffs (NRR 25)5Summer Marlin LaneMay 2, 2013We laughed so hard when we tried the ear muffs on our daughter they were so cute! We have a private plane and needed something to protect our little ones ears and these worked great. I even tried them on to make sure they weren't going to be too tight on her head and they were perfect! Tasco Kidsafe Headband Style Ear Muffs (NRR 25)5SEApril 23, 2013Got these for my little one. They fit him well. They also fit my husband who has a big head. Glad my kids will be able to use them even as he grows. Definitely good at noise canceling. Tasco Kidsafe Headband Style Ear Muffs (NRR 25)5Mandy BApril 14, 2013I bought the Tasco Kidsafe Headband Style Ear Muffs for my 5 month old. The ear muffs fit him great. We went on a civil war cemetery tour where a cannon was shot a few times. He only flinched a tiny bit when we were about 20 feet away for it, so I think the ear muffs work good. Tasco Kidsafe Headband Style Ear Muffs (NRR 25)5Amanda HessApril 3, 2013We bought a pair of these for our 8 month old to wear to the drag strip this past weekend. After working with him a lil to get him to keep them on his head lol they worked perfect. He left them on all day at the drag strip and actually fell asleep with them on. He never flinched at the loud cars when wearing them and after he fell asleep never flinched at any noise. I am a very satisfied customer. Thank you! Tasco Kidsafe Headband Style Ear Muffs (NRR 25)5JoyMarch 16, 2013I got two pairs of these for my children (2 1/2 yrs and a 9 month old). They arrived fast, fit great and did what they were supposed to! We used them for our children's first plane ride to help with the loud engine sounds and also for the 9 month old to nap on the plane. They worked great! Tasco Kidsafe Headband Style Ear Muffs (NRR 25)5KelliMarch 15, 2013My 23mos old has SPD and my main concern is his auditory hypersensitivity. When we go shopping or to our baby play class, if there is a loud child near us, he goes into a full meltdown and we have to leave the area. I did some research and found these earmuffs. I ordered them right away and received them very quick. Our first test was baby play class. He left them on the entire time and only got a little uncomfortable when a child was screaming right next to him. I'm extremely happy with them. I'm so relieved that we can go out into the world and he won't be in pain or get upset. He did great shopping and our next test is gonna be a movie and then his birthday party in 2wks. Thank you Tasco! Tasco Kidsafe Headband Style Ear Muffs (NRR 25)5PatriciaMarch 8, 2013I am taking my 4 year old (who is sensitive to loud noises) to see some Monster Trucks in a few weeks and started researching ear plugs. I found these, so ordered them two days ago and they were in my mailbox today. I was shocked that they came so quickly. I tried them on my son, adjusted them to cover his ears properly and they fit him great. We can hardly wait to try them out at the Monster Truck rally we're going to. Tasco Kidsafe Headband Style Ear Muffs (NRR 25)4AmyMarch 7, 2013Got these for my 4 yr old & 2 yr old, and myself for a trip to Monster Jam. I thought they were great. Fit all of us just fine. My 4 year old even fell asleep (at Monster Jam!!). My 2 year old wore them briefly but then started to refuse: she LOVED the noise! Tasco Kidsafe Headband Style Ear Muffs (NRR 25)5GilbertFebruary 19, 2013I did quite a bit of research on the web, your website was by far the easiest one to get the information I needed. Was surprised when ear muffs showed up 3 days later, exceeded the expected time arrival. My son (2.5 years) was a little apprehensive when I showed him his new ear muffs. But once we put them on he smiled and said 'very quiet' now he loves them when I go outside to do yardwork with my gas powered tools. Can't thank you guys enough! Tasco Kidsafe Headband Style Ear Muffs (NRR 25)5LindseyFebruary 5, 2013Got these for my 4 month old to wear at mardi gras parades and they work great! Fit him well and must be comfortable box he lets us leave them on. He has no problem w the noise. So glad we got them! Tasco Kidsafe Headband Style Ear Muffs (NRR 25)5Vic SmartJanuary 31, 2013Great for my 20 month old for his first Monster Truck rally. He likes to wear them. Tasco Kidsafe Headband Style Ear Muffs (NRR 25)5Jessica FarnsworthJanuary 26, 2013These are a good product for its purpose of ear protection. I ordered them for my 2 month old nephew for when he is in a gym to watch basketball games. But they are a little large for a child of that size. Wish they came in a smaller size. They really wont fit him well until he is at least 2 years old. Otherwise good product. Tasco Kidsafe Headband Style Ear Muffs (NRR 25)5JennieJanuary 23, 2013Had my 2 1/2 year old son try these on as soon as we got them in the mail - he thought they were really cool. Took them to a monster truck show and he kept them on the entire time so they must had been comfortable! Tasco Kidsafe Headband Style Ear Muffs (NRR 25)5Megan BrownDecember 19, 2012These are great for my son, who is almost 5, but the size of a 7 year old. They seem to be comfortable to him, and he uses them regularly when it's loud, in the car, and he can easily remove them and put them on by himself. Sturdy design, should last a long time. Tasco Kidsafe Headband Style Ear Muffs (NRR 25)5MarlyneOctober 2, 2012I was not sure on this purchase, but I went ahead with it as we were flying with our 3 1/2 year old Grandson and he is very sensitive to louder noises. I must say, he was an angel on the plane! The minute it got loud he asked for them and wore them the rest of the flight. He was able to sleep with them on. He even asked for them when we went into the restroom in the airport, as the toilet flushing was too loud for him. Best purchase I made for the trip. Tasco Kidsafe Headband Style Ear Muffs (NRR 25)4KristiJuly 1, 2012Bought these for my 1, 4, & 6 year olds. They're a little big for the 1 year old but are great for the other two when we are air boating!